services that they receive. We strive to provide the best non-pressure roof cleaning in the industry at fair prices to our clients and business owners. Provide a learning environment for our RCIA candidates to complete their training. 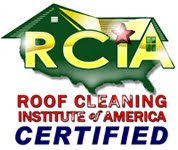 Use a learn-by-doing approach to train our RCIA candidates to work on actual home and business roofs. Candidates will be required to participate in forum discussions and offer personal input on numerous subjects and topics. Develop lifelong business relationships with our RCIA candidates. Conduct research aimed at improving our services and increasing the body of knowledge about the non-pressure roof cleaning industry. candidates. Participate in efforts to create and promote relevant standards. Disseminate technology and practices to others. Develop relationships with organizations pursuing similar goals. Provide leadership in these activities.